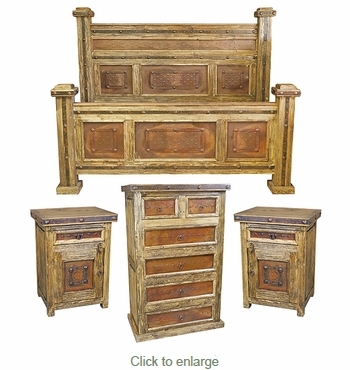 This rustic wood bedroom set with iron panel insets and rustic iron harware includes a King size bed with headboard, footboard and side rails, dresser and two nightstands. The iron panels, bands and clavos that accent this beautiful bedroom set make it perfect for any southwest or ranch decor. Our rustic bedroom furniture is handcrafted from solid, kiln-dried pine and will create a warm and inviting atmosphere in your bedroom.